Facilities Management embraces diversity, inclusion and equality within the University and those characteristics that make everyone unique. 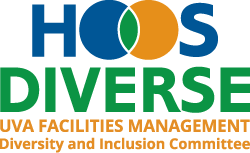 Join the Facilities Management Diversity and Inclusion Committee by getting involved and utilizing the resources compiled on the Hoo’s Diverse webpage to champion diversity and inclusion within Facilities Management. Creating a culture which celebrates the value of each Facilities Management member through engagement and education. The Facilities Management Diversity Team defines diversity as those characteristics which make each person unique. In 2012, Facilities Management held workshops to address the four areas identified by the staff survey to improve employee satisfaction. The Diversity Momentum Action Team was created to initiate action to drive positive change. Over the course of two years, the team met with diversity experts across UVA to develop key recommendations to help initiate positive change within Facilities Management’s workplace. The Facilities Management Diversity Council was created in December 2013 to continue the efforts started by the Diversity Momentum Action Team, and to foster greater respect and understanding of diversity within the organization. The Facilities Management Diversity and Inclusion Committee has started a departmental-wide initiative to have Employee Engagement Representatives throughout all areas of Facilities Management. This program supports the committee’s goals to create an engaging environment that celebrates employees, improve supervisor-employee relationships and provide employee support. The representatives are employee volunteers and diversity committee members who keep employees in their assigned areas aware of ongoing programs and opportunities. They also listen to feedback from employees about what could be done to improve employee engagement and inclusion.